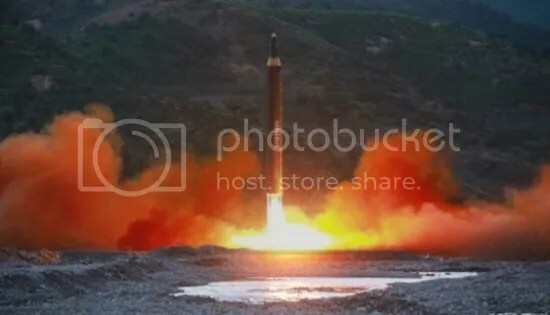 A test missile launch by North Korea last week. (North Korean State Media). North Korea launched an intercontinental ballistic missile this past Friday, it’s second in 24 days, with the ability to reach the United States. With its latest test launch, the country’s missile program has rapidly progressed ahead of expectations. The sudden escalation of the program, however, leaves experts wondering how North Korea is able to build an advanced missile system in such little time, and with limited resources. This speculation relates to the international sanctions placed on North Korea, and its restrictive economy. Since 2006, North Korea has been under UN economic sanctions, aimed at combating the country’s nuclear program. On top of the sanctions, North Korea’s closed economy has left the country impoverished, and only able to export limited amounts of coal, textiles and weapons. Having suffered economically for the past decade, and with little to no manufacturing industry, North Korea likely cannot support its own nuclear program. So how is North Korea’s leader, Kim Jong-un, funding and building his nuclear program? Most signs point to support from one of North Korea’s last global partners: China. In order to raise money for its military, North Korea relies on several sources of income such as cash reserves, ransoms from cyberattacks and forced labor of its own citizens. The country’s greatest source of income, however, comes from coal exports to China, amounting to several million tons per year. Though China stated in February that it was halting imports of North Korean coal, experts say Beijing’s pronouncement was insincere. This leaves North Korea with a viable source of income to continue developing its nuclear program. The China-North Korea border. (China-files.com). China is also North Korea’s greatest source of imports, accounting for around 80% of all goods brought into the hermetic country. Though UN sanctions prohibit shipping products to North Korea that are capable of being weaponized, banned Chinese goods still make it into the country. The problem is exacerbated by some Chinese companies who act as middlemen between manufacturers and North Korea, shipping prohibited items to the country in violation of the sanctions. It is clear that North Korea is not able to finance or build its own nuclear program. Instead, China continues to support Jong-un despite his malevolent intentions, but in furtherance of its own geopolitical goals. To that point, a diplomatic effort by the US must be made to address China’s interest in the Korean peninsula, in exchange for termination of their financial and material assistance that is sustaining North Korea’s nuclear ambitions. The motivation for China’s support of North Korea is not to further Jong-un’s nuclear program. In fact, China has taken steps, albeit at times disingenuous, to punish North Korea by halting coal imports. Rather, China’s objective is political- it is concerned with the possibility of a humanitarian crisis arising from the toppling of Jong-un’s regime, and the subsequent unification of the Korean peninsula under American terms. In the event of a US invasion of North Korea, Jong-un’s government would likely be deposed in a matter of days. In that case, China would absorb millions of refugees fleeing across the permeable border shared by the two countries, leaving the government to address a humanitarian crisis within its own borders. 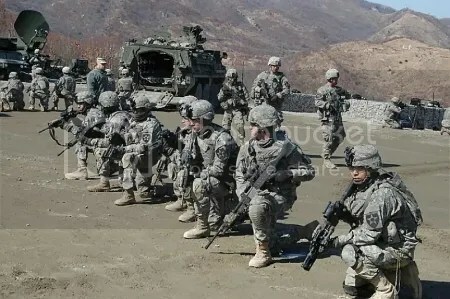 American and South Korean troops during a training exercise. (John Rabiroff/Stars and Stripes). China’s largest concern, however, is the unification of Korea, with South Korea assuming control over the peninsula and catering to the interests of its ally- the United States. Korean unification would lead to another source of apprehension for China- increased American military presence in the peninsula, with more troops stationed along the border and warships frequenting the Sea of Japan. Out of China’s geopolitical concerns comes a diplomatic avenue to solve the North Korean crisis without armed intervention. The US government should assuage China’s fears by offering assurances that, in the event of a failed North Korea, American military presence in the peninsula will not increase over time. More importantly, the US government should conclude its policy of Korean unification, dating back to the 1953 cease-fire, in exchange for China’s complete embargo of North Korea. By recognizing China’s objections to Korean unification, and pledging not to increase military presence in the area, the US can eliminate North Korea’s financial support by making a deal with Beijing. While this solution does not extinguish Jong-un’s belligerence, it would cripple his nuclear ambitions and possibly avoid war and a humanitarian crisis. Most of all, it is a diplomatic and peaceful avenue for evading a destabilizing military conflict that would place the entire globe in peril.